Want to know what really excites me these days? Anytime I see a prospect who after signing his Entry Level Contract goes out and plays a solid game as if to say "Yes I was worth signing." I can't begin to tell you how many times a prospect will sign his new deal and then slack off as if he doesn't have anything left to prove. This is why seeing the way both Anthony Duclair and Ryan Graves elevate their game after signing their contracts is a happy sight. Tonight's theme is about the defense as it was defensive prospects who made plays and had impacts in their team's games on Friday night. Ryan Graves (NYR 2013 4th) has been elevating his game for the last month and the Val-d'Or Foreurs are very happy that he is. 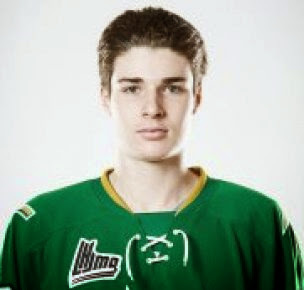 Graves was named the game's 3rd star as the Foreurs took game 1 of their QMJHL playoff series against the Acadie-Bathurst Titan 4-1. Graves had a strong night at both ends of the ice as the 6'4 defender had a primary assist on 1 shot with a +2 and 2 solid hits. Graves had the primary assist on the Foreur's 3rd goal which came in the 2nd period as the Foreurs jumped out to a 4-0 lead and kept the Titan at bay for the majority of the game. The Foreurs came into this game as the 3rd seed in the QMJHL playoffs and are heavy favorites to knock off the 14th seeded Titan in 4 games. For Graves his assist was his first career playoff point in 7 playoff games. Game 2 will be Saturday night in Val-d'Or and to answer questions; Val-d'Or is located in Quebec and the team's nickname of Foreurs is translated to Drillers to highlight the area's long connection to mining. Like Ryan Graves, Adam Pelech (NYI 2012 3rd) did not kick back after he signed his Entry Level Contract with the Islanders as Pelech helped his Otters avoid an embarrassing Game 1 loss on home ice to the Saginaw Spirit. Pelech earned the secondary assist on Dane Fox's power play goal at 18:18 of the 3rd period giving the Erie Otters their first lead of the game at 4-3 as they held on to win game 1. The Otters had to comeback twice in this game as Saginaw led first 2-0 and then 3-2 as they tried stealing the home ice advantage from the Otters. The 3rd seeded Otters were playing in their first playoff series since 2011 and it looked like the jitters put them in an early hole as Saginaw scored first at 1:04 and then again at 6:18 to jump out to their 2-0 lead. Erie rallied to tie the game but Saginaw would not go away as they regained the lead and almost forced overtime. The Spirit played with a lot of Spirit and if Erie is not careful, they might be in for a bigger fight than they were expecting. Loic Leduc (NYI 2012 4th) made it a hat trick for defensemen on Friday as he was a little of everything in helping his Rimouski Oceanic survive the Chicoutimi Saguenéens 5-3 in game 1 of their QMJHL playoff series. Leduc had a primary assist on a shorthanded goal, he was a +3 on 2 shots and he tossed in a fight to go along with everything else. Perhaps the best way to describe Leduc is imagine if Sean Avery had been 6'6 in a playoff game against the Devils. Leduc was to his credit an active player both good and bad but he was trying to make plays and that is what you want from your older players in the playoffs. Not sure if the Islanders are going to sign him but pretty sure if the Islanders don't there will be teams lining up to sign the 6'6 Leduc as he may be a project but you can't teach size. Troy Donnay (NYR 2013 UFA) was scoreless but picked up a +1 on the game tying goal as part of Erie's 4-3 win over Saginaw. Jesse Graham (NYI 2012 6th) was also scoreless but a +1 for the Spirit as this series is being played in the 2-3-2 format because of the distance between Saginaw Michigan and Erie Pennsylvania with game 2 scheduled for Saturday night. Erie needs to be very careful as a loss in game 2 sets up 3 straight games in Saginaw. Brady Skjei's (NYR 2012 1st) Minnesota Golden Gophers have been playing with fire for the last month as the top ranked team in the US colleges has been playing down to the level of those they faced. In the Big Ten Conference's semifinals it cost Minnesota as Ohio State knocked off the Golden Gophers 3-1. Skjei was on the ice for all of Ohio State's goals as he was a -2 on 1 shot. Teammate Taylor Cammarata (NYI 2013 3rd) had the primary assist on Minnesota's only goal for his 13th assist and 22nd point but that was about it for Minnesota's offense. Jake Bischoff (NYI 2012 6th) was scoreless and "even" on 1 shot. Minnesota in my eyes was sitting there just waiting for the expected number 1 seed in the NCAA Tournament and forgot to go out and earn it. Now if it was up to me I would give it to Union College who may not play in the powerhouse conferences but they are the winningest team in the USA right now. They earned being number 1 in the polls last week but didn't get it despite winning. It is time to reward teams that win their way into the NCAAs. Steven Fogarty (NYR 2011 3rd) and his 8th ranked Notre Dame Fighting Irish were shut out 4-0 by 7th ranked UMass-Lowell in the semifinals of the Hockey East Tournament. Fogarty was of course scoreless but also shot less and a -1 as Notre Dame might have cost themselves a 2nd seed in the NCAA Tournament with the loss. Fogarty and friends are a sure bet to get an invite because of their strength of schedule and quality wins but I don't see them as a legit NCAA contender. You have to have a consistent game to do that and Notre Dame is far from consistent. Victor Crus Rydberg (NYI 2013 5th) had 2 secondary assists on his Plymouth Whaler's 2 goals but the Whalers fell to the Guelph Storm 5-2 in game 1 of their OHL series. The Whalers are no match for the Storm and it did not help the Whaler's cause when 2 of their players took a couple of cheapshots that it would be a surprise that the OHL did not sit them down for some games. Crus Rydberg didn't look out of place in his first OHL playoff game but he needs another year to see if he is worth a contract. The news out of Quebec does not look good as Anthony Duclair (NYR 2013 3rd) still has not received clearance to resume hockey activities and the Remparts don't even expect him to join them on the road when Quebec plays Rouyn-Noranda for games 3,4, and 5. Rouyn-Noranda defeated Quebec 5-4 in overtime to steal away home ice. There is a very good chance that Duclair might not get to play anymore hockey this year. Goalie Stephon Williams (NYI 2013 4th) Minnesota State who advanced to the WCHA finals. Goalie Eamon McAdam (NYI 2013 3rd) Penn State -eliminated 2-1 by Wisconsin. McAdam finishes his freshman season 0-9-0 with a 4.09 goals against and a 0.882 save percentage.